Ahem!!! (could I have some water please? Thank you!). I am not going to be modest here: My research team and me have made a discovery that will shake the very foundations of modern science. This originally started out as a gender study of male sexist prejudice. In the end we had to get help form our esteemed colleagues in the physics department to find an explanation for this phenomenon. 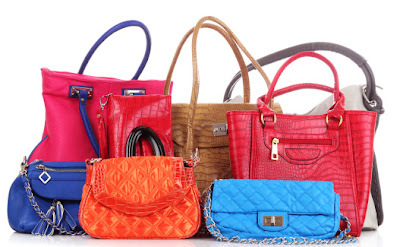 We set out to find out how long we would be able to get an American male to hold a woman's handbag before his discomfort became ethically intolerable. It turns out most healthy men do not last for more than 45 seconds in the presence of others, at which point they will throw the handbag away. This period may be prolonged to 65 seconds if they believe themselves to be alone. When we added a reward -- 10 dollars per minute -- some were able to hold the bag for as long as 2 minutes and 32 seconds. What we did not know, however, was that one of our test subjects, Jason Cameron, being unemployed, desperately needed the money. He was able to hold on to the handbag for 14 minutes and 35 seconds, at which point the was a flashing light, a loud crack, and Mr. Cameron was replaced by a woman. That is: Mr. Cameron had become a woman. This amazing discovery proves once and for all the basic principle of quantum physics, that reality is caused by the interaction between reality and our minds. In this case the emotional conflict in Mr. Cameron's mind caused an unknown superimposed gender state to collapse and switch his physical being into its female counterpart. Basically, the human mind is incapable of handling the psychological conflict of gender ambiguity and changes reality in order to protect its sanity. 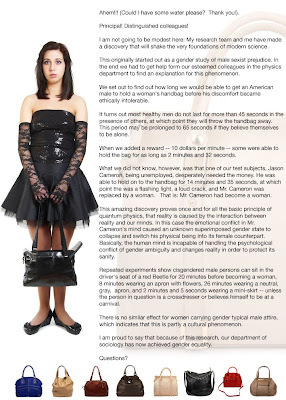 Repeated experiments show cisgendered male persons can sit in the driver's seat of a red Beetle for 20 minutes before becoming a woman, 8 minutes wearing an apron with flowers, 26 minutes wearing a neutral, gray, apron, and 2 minutes and 5 seconds wearing a mini-skirt-- unless the person in question is a crossdresser or believes himself to be at a carnival. There is no similar effect for women carrying gender typical male attire, which indicates that this is partly a cultural phenomenon. I am proud to say that because of this research, our department of sociology has now achieved gender equality. If only... one can dream, yes?